What workshops do I offer? I am glad you asked. Because I now have a much more helpful answer - please go to the workshops page on this blog or view the brochure for details of workshops in storytelling & poetry. And get in touch - I would love to come and share with your group! Can worship and its preparation be more playful? Does your experience of weekly worship feel more like channel surfing than affective and engaging food for the soul? Give your worship leadership fresh inspiration by attending Enriching the State of Play. The day will begin with an address by Ian Price who will identify key challenges and opportunities in worship preparation and leadership. Then four gifted practitioners of visual art, liturgy, music and drama will demonstrate ways in which they integrate their art to help worship flow. Following a catered lunch, workshops will be offered around themes such as setting sacred space, preaching, music, storytelling and the use of poetry. Along with general principles and creative ideas, you will leave with an example of a spirited service for Pentecost Day; one to share and use. Having stripped the church of much of the decorations for Good Friday, I replaced most of it right up front for Easter Day. 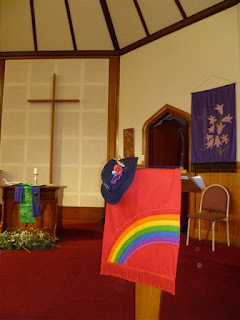 But I left the banner down and the lectern drop up, ready to hang, and covered the table with its gold cloth, cross and flowers with the black and some of the symbols from Friday. I discovered when I was at the church for the redressing on Saturday that some folk had brought their clay crosses and placed them with the symbols from the story, their response to the encounter. Saturday, Sue and I (with a little help from a granddaughter) hung the pieces people had submitted from their lenten creative spiritual practice. We had invited people to take a canvas and do with it what they wished, creatively responding to the story of God's love however they engaged with it during Lent. 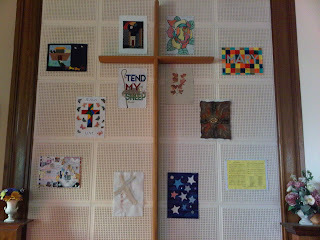 The plan was to hang them behind the cross, as a way of exploring what we might do with that space, which is at present not terribly creative, attractive or inspiring! As we shared our vision for our Holy Week gatherings, the worship team at Belair Uniting agreed that we wanted Good Friday to have a starkness, an emptiness, a rawness about it. We had also had a contribution from Lorna, the 90 year old grandmother of someone I went to school with (love being a minister in the general neighbourhood of my growing up), which fitted this desired mood - Lorna had at previous congregations coordinated a display of symbols from the story of the arrest and crucifixion of Jesus, which she shared with me, and which I was keen to include if we could. As I looked at the materials from Seasons of the Spirit, it seemed as if the worship outline written by people from Darwin over a year ago, was written for us here in Belair. The writers had suggested a very simple, paired back telling of the story from the Gospel of John - interspersed with the Psalm he cites on the cross, Psalm 22 (My God, my God, why have you forsaken me?). Each year, three churches in the Mitcham Hills combine for ecumenical services for Ash Wednesday, Maundy Thursday and Blue Christmas. This year, we were hosting Maundy Thursday, and the worship team decided they would like to hold a Last Supper gathering. So Bek researched the menu, drawing on the Passover traditions that would have shaped Jesus' meal with his friends, according to the stories, we gathered volunteers to prepare the lamb (and rice and salad, for a fuller meal), bought bread and wine / juice, collected jugs and chalices, and prepared the stories for telling. My preference for the Sunday leading into Holy Week is for Palm Sunday, rather than Passion Sunday. What’s the difference? 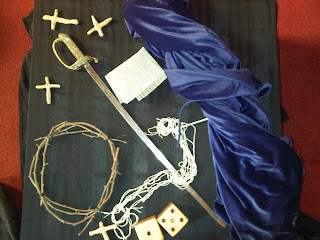 Passion Sunday recounts the whole story of Holy Week, which seems to me to skip to the end too soon. Palm Sunday begins the story with Jesus’ arrival in Jerusalem, and begins the turn from triumph and hope to disappointment and despair of Maundy Thursday and Good Friday, before the resurrection of hope and new life of Easter Day. I find it more helpful to embrace a lingering with each moment in the story, no matter how discordant, uncomfortable, or disturbing those moments may be. There are all sorts of emotions woven through the stories of Holy Week, and these emotions will resonate with each of us differently, and differently each year we encounter the stories.